Club Penguin Cheats by Mimo777 Club Penguin Cheats by Mimo777: New Club Penguin Card-Jitsu Fire Glitch! Then, click on the flame at the bottom of the screen and it will take you to another start up screen. Now, click start button and log in to another penguin. If you go to the same server, you can play 2 or more penguins at the same time. I actually did 5 penguins at once! Cool, huh? UPDATE: Club Penguin has now fixed this glitch. Oh well, it was cool while it lasted! Mimo can you make me a moderator I check your site everyday! It isn't working for me, Mimo. I always get the orange pop-up thingy. I do all of what you say to do. Can anyone help? Kewl. Also, you sound just like someone I know from another website.. It doesn't work for me, it just says "close the other tab" I will keep trying. Mimo, have you seen the new Card Jistu Fire Start Screen? There is an amulet on the penguins neck too. mimo can we have a mod change next week? :) hope we do. I doesn't work they probaly fixed it. They fixed it. Now it will just say you can only have one penguin on. COME ON CP LET US HAVE SOME FUN! nice work Mimo keep up the great work! So how do you get the Sensei Ninja background? BTW next time i c the rest of the Club Penguin Gang, you have to add me :) not saying you do mimo, just your siblings ;). I need to have all of u for my collection!! Noooo! I don't know why but it wont work. Maybe i just read it wrong.. but i am sure i did read it correct. Dude, y did u post this 3 times????? MIMO! i know what the amulets are for! it when you finish your fire training you might get that! its like the ninja mask when your done with car jitsu training! hmm.. it doesn't work for me :( oh well. It did not work is there a time that you need to click on the fire thing? Maybe mimo just cot it earliy so you should try and find another way to do this. LuckyG10 said...Mimo can you make me a moderator I check your site everyday! Well, its Mimo's choice, and Im not a mod myself. u have to earn it! try hard! answer questions! from now, my motto'll be.. Helping is PHUN! Thats right, u should keep trying! and have you been doing it on a "tab"? because mimo sad browser NOT tab. Hope that helped. Helping is PHUN! Well Im not sure if we all have the same kind of computer as mimo. i dont think going on a pc computer really makes a ddifference. maybe, but as i said, not sure. who really cares, right? Helping is PHUN! 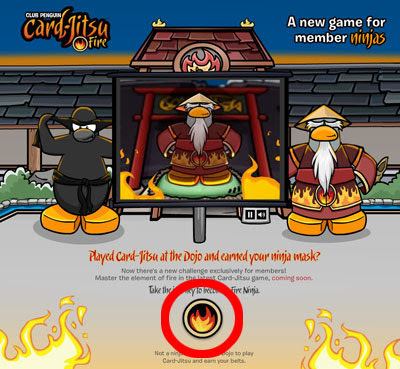 To get that background you have to meet Sensei and click on the little box thingy on his player card. So do I! But I still have to work for a spot on the Mod list. You can look at all the rules on the right side bar where the post says CPG Mods or something close to that. The members of clubpenguin probably fixed it. They, for some reason, hate it when you have more than one penguin up. It does not work! I think you need 2 computers! Yeah I'm pretty sure they fixed it. BTW why did you post that 3 times in a row? We get it, it doesn't work anymore. That is really, really smart. I never thought about that. Probably not, they probably just fixed it. Everyone wants to be moderator! Even I do. And almost everyone on cp checks mimos site everyday. You have to answer questions! You can't just beg! more details on the sidebar. I just open new tabs at the login, and that works fine for me. darn it. it's been fixed awww have to be quicker next time mimo U ROCK! To get the sensei background cust find sensei, click on his player card and click the button with a box to get a gift(the background). Hope this helped. To beocome a mod just answer other peoples questions for mimo. You can find more info on the be a club penguin gang mod page. Hope this helped. To get the Sensei autographed background you have to meet him sometimes Mimo organises a comment tracker, you can't ask Mimo to add you because other people will ask and it will not be fair! you have to earn mod and work real hard to earn mod. Sorry Mimo but this glitch doesn't work :( I have tried a few times but nothing .Isn't a problem .I am not sad. I was Evda, Evda2, Oasiliao, Hallowi and Mijo! If it's a GLITCH that he didn't create, no. He didn't have anything to do with it. He just FOUND it. MIMO MIMO MIMO you know in the video where Sensei stands and there are penguins around him (not ninja) well if you look behind him you will see a road somewhere, is it a new room? or another entrances? You can be a moderator but you need to be answer people's questinos -just like me- And there will be a MOD SHAKE UP every month and you will see you name at the mod list, if you are good! And DONT forget to put (CPG MOD) by your name while answering questions! WOW, it's you lol! Good Job dude! It's hard to get credit from MiMo! I'v e never been able to do something like that! Hey mimo, if you go into the dojo courtyard theres a black rock for the part of the amulets! Yeah, he knows. And only add da 'CPG Mod' after ur name if you are modding! Don't worry cp cant ban you for finding glitches but its fixed now anyway.Hope this helped. Thanls for the cheat!I didn't spot that until you told me! Srry! Mimo can't just make you a mod! You have to work for it by answering people's questions! Lucky, in order to become a CPG moderator, you have to answer other people's questions. For more help, check the side bar on the right that says "Be a Club Penguin Gang mod! Click "click here for more info." I'm really excited! Here's some FYI: MOD CHANGES ARE !THIS! WEEK! I'm not sure if this is important or not but I just wanted to say!! When you could meet sensei, you could this background! I have got an idea for another type of contest.You pick a clothes item(for example,the Black Whirlpool Snowsuit)and ask us when it first came to catalogs(like Nov'09).Rockin cheats! Hey,Mimo when i try to log on at Willington and Wenks it would not work, Do you know whats happenning? ahahahaha it wont work why? Mimo only makes people who help other people moderators. Hope this helped. It isnt working for me, mimo. I always get the orange pop-up window thingy. I do all of what you say to do. Can anyone help? I think I might be able to help. Club Penguin fixed this glitch so it doesnt work anymore, but I had luck and for some reason the 1st time I tried it it didnt work. The 2nd time i tried it it did. That probablly wont work for you, so im sorry to say your out of luck. aww man i tried it yesterday and it didnt work! 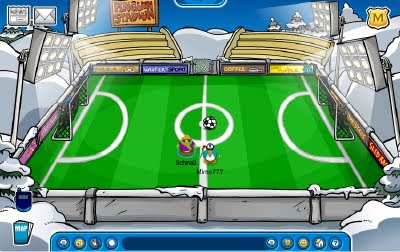 I know CP fixed the glitch, but like mimo said it was cool while it lasted. Mimo can you make me a moderator I check your site every day. I visit his website every day too! Although you visit it every day thats not what be a mod is. A mod answers other peoples questions and tells them something, like im doing right now. Going on a PC computer probably won't make a difference.The glitch just didn't work because Club Penguin fixed it so it doesn't work anymore. Well it doesnt work anymore but it didnt ban you while it lasted. No, not if you downloaded something. You get banned for using a 3rd party program! Clubpenguin fixed that glitch! That's why! Mimo doesn't automatically make mods (: Just wanted to cleat that up. Second, I'm sure that you can find the link to the rules on being a mod somewhere here! And third, It helps alot answering questions in the comment sections on posts! Awesome glitch Mimo! You ROCK! too bad! i missed out! oh well... i like to see if some words show up. like i know "dimentio" doesnt show up. hes my favorite mario villain. ("Ah ha ha ha ha ha. Oh no, magic is no laughing matter. I am always deadly serious.") fawful is a very, VERY close second. ("I drizzled rage dressing on the country next door! Rage dressing on a salad of EVIL! ")too bad... Keep on Wadell-ing! um, no he cant. yet. you have to do more then just check his site. answer questions in the comments and congradulate new mods. oh! thx for reminding me! one last thing! ive been forgetting to do this, put "CPG Mod" at the end of your name! Keep on Wadell-ing! WHAT?! next week?! that doesnt give me much time... if he says yes anyway... ive just gotten back into modding! well id just have to wait huh? Keep on Wadell-ing! Yeah welcome back Leggo & Confu!! Great to have you back at CPG!!! Hey r u Matthew722 and you changed your name, or are you somebody else??? P.S. If you are Matthew722, do u still love doughnuts??? It Hasn't been updated yet, it still works. I'm on my penguin and my sisters at the same time. There might be some communication errors though, the penguins took a moment to be able to speak with each other... But then they spoke perfectly! Sooo Cool! I don't understand why clubpenguin has to ruin our fun. Once they find a problem that's really cool, they fix it. It's not fair. I'm not a member and it worked for about five minutes. I was gonna buy a new puffle but cattaloge wouldnt load.so i crossed it and went out side to the plaza.Then the cataloge came out of no where. Can u help me please.I am stumped. That's very interesting! I don't know how it would have happened, but, hey, then you could buy the puffle from the plaza! that looks so cool! too bad it ended already! imo, your awesome!